What exactly constitutes to a failed session? It is subjective of course, but you will know it when it happens to you. 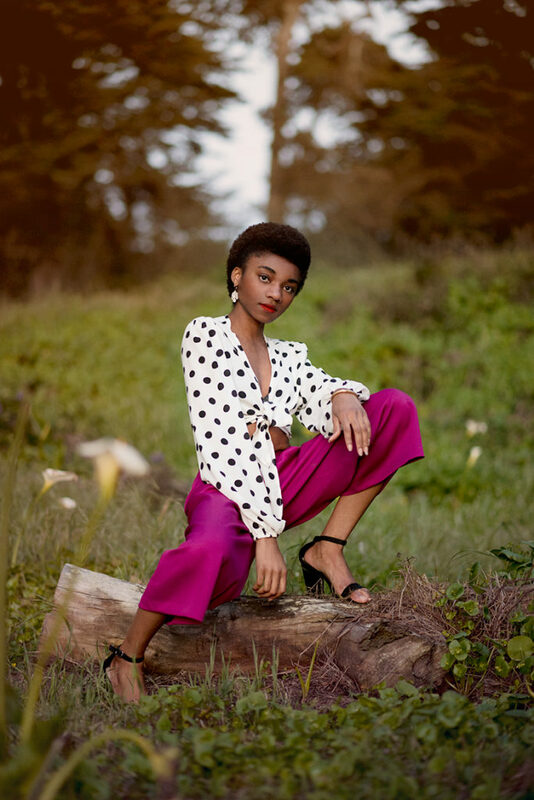 For me it took place on a cloudy day in San Francisco, ironically this shoot was supposed to be the one that I was most amped up about. But alas due to some bad decisions (on my part), and some terrible planning…it just didn’t go the way I had intended. The biggest disappointment that came out of this session was the sense that I inconvenienced someone else; my model loved her photos but I knew that I could have possibly done better if I had arranged the shoot with more tact. To start off, the weather was awful and unforgiving. Wind speeds of at least 20 mph and terribly chilly even with a heavy jacket; we ended up not actually going to the location that was planned due to the amount of people that were present in the park. We also did not have a chance for any wardrobe changes since the model was under a time restraint. So I had to shoot on location and even though the photos were quite awful…thanks to Photoshop (thank goodness for the power of post processing), I was able to salvage a few decent shots. My model was Erica and she was effortlessly beautiful, there is no doubt in my mind that she will be a successful model if she continued down this path. I am so grateful for her kindness and empathy! I do hope to make it up to her in the future by redoing the shoot and to compromise for my lack of professionalism. Either way here are the photos from the shoot with one before post processing and one after. It took me several days to get over my disappointment but after a few trips to the ice cream store and a long hug from my husband, I was positive again and determined not to make such stupid mistakes in the future. I am ready for whatever the future will bring, never give up! Sometimes the best things happen when you least expect them. 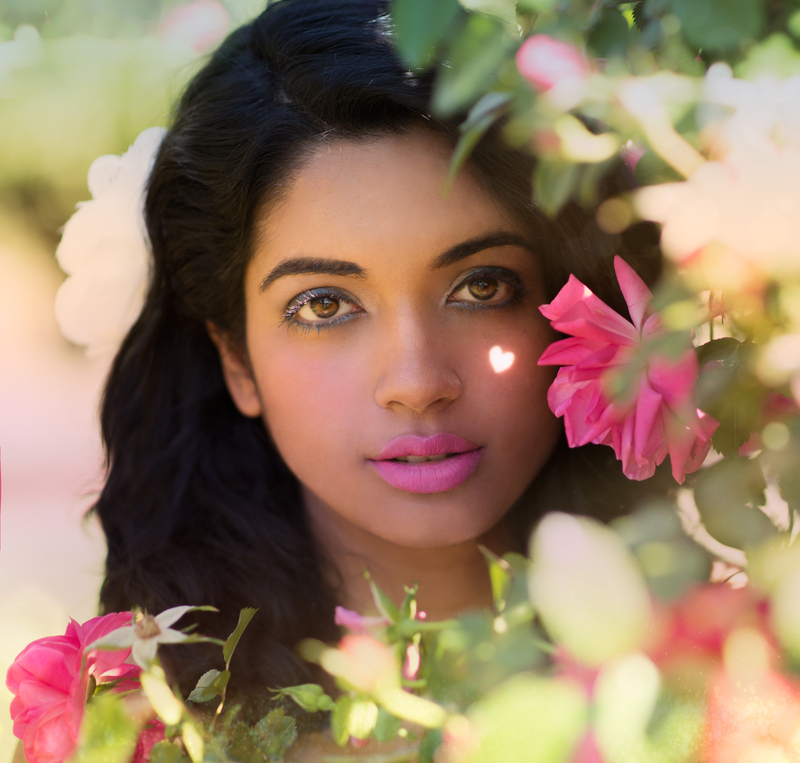 I got to meet Deepti, a model who is as beautiful inside as she is outside. If you are someone who (like me) believes that true humility is a rare and wonderful attribute, then imagine my excitement when I got to work with this awesome gal. 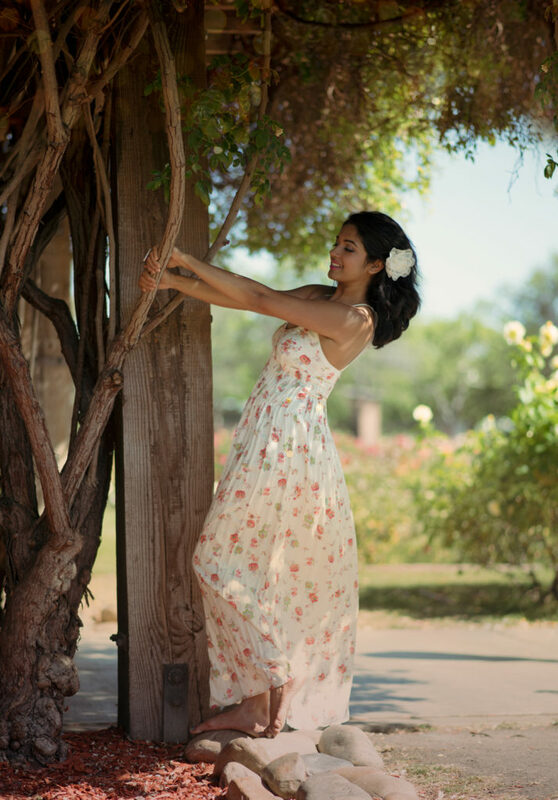 This day turned out to be one of the most fun I have ever had on a shoot, mostly because of Deepti’s graceful humor and also due to the incredibly location! The Municipal Garden in San Jose is in full bloom, and nothing can be prettier than the acres and acres of flowers showcasing its best dress. The Municipal Gardens when the flowers are in full bloom! 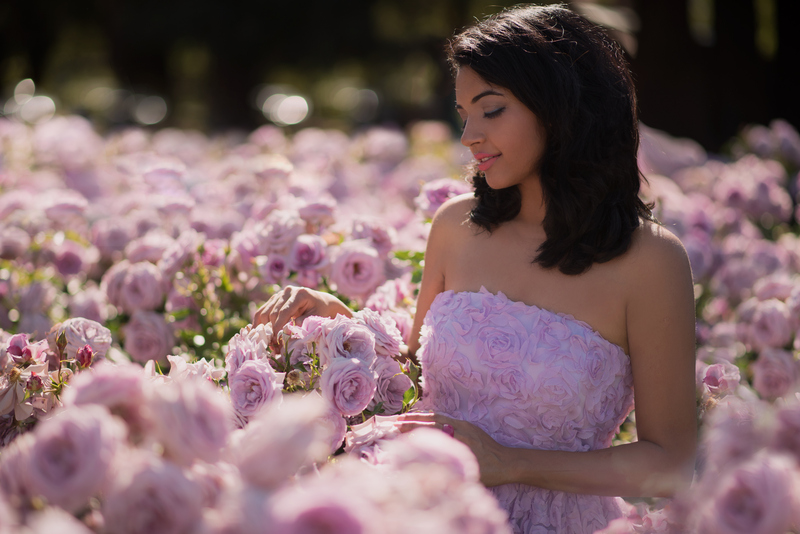 As a photographer you always hope that your model will have great chemistry with the camera– this isn’t always the case of course, but Deepti is a natural! Her attitude is so warm, graceful, elegant, and she is always coming up with great ideas. The garden itself was both a blessing and a curse; I have terrible hay fever and regardless of my precautions I was still sneezing incessantly. The pictures came out beautifully, and yes I was so daring that day that I flipped the switch to manual mode and started to shoot! I felt really brave <3 haha. Her dress matched the flowers perfectly! A little speech about making mistakes, personally I reflect on my blunders with a bit too much self-deprecation. My perfectionist self is always so critical of everything that happens: perhaps I forgot to move a branch that was blocking a model’s arms, or I accidentally included something in the photo that wasn’t supposed to be there, or I didn’t capture the subject’s feet. All very frustrating on hindsight, but all important to know and to learn from; never be afraid of slipping up! Overall it was not only a productive day, but I also made a friend. I understood the meaning of the word “muse” and I think I can apply it here, I honestly did not expect such great chemistry. We are planning on a second shoot =]. 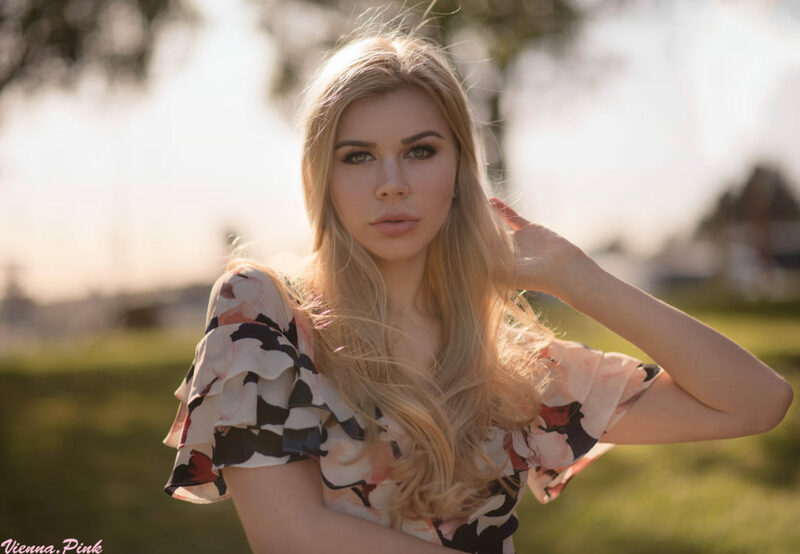 I had my second photoshoot with Ms Kseniya, who is as lovely and wonderful as her pictures portrayed. We met up in front of City Hall on a very gusty day in San Francisco; the weather forecast was not kidding when it said high winds! It seemed like an impossible day for a photo shoot, but perseverance prevailed! Had such a blast hanging around SF as usual, so many places to see and so many pretty sights to feast your eyes on. We did end up taking a few photos inside City Hall, but due to the high number of weddings happening at that particular hour, we decided to just shoot out front. A windy day in the city. Once again we traveled to the gardens and had a session there. The weather was just as awful as the day progressed. But overall I think I walked away with some great shots =]. At home I was going through the photos and realized that some of my favorite images were terribly under exposed, this is where Camera Raw became my best friend. 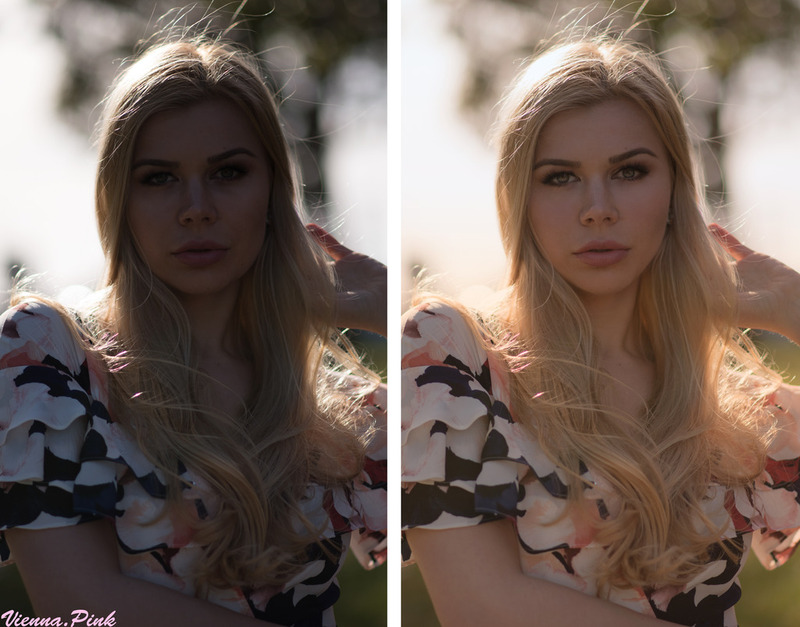 I was able to increase the exposure quite a bit on Kseniya’s face and hair, while preventing the background from becoming too bright. As you can see, I did some extra work on her skin and eyes, this didn’t take very long as my model already have very good and beautiful skin. I also retouched her makeup, added some highlights to her hair and some shadows around the face. Here is a before and after shot! The before and after post processing. In the final photo I managed to removed some landmarks in the background, then processed the image through another round of Lightroom where I used the magic brush on her skin to “brighten” it up some more. I think the result looks fantastic! Overall a fun and wonderful outing with a beautiful and generous stranger, thanks Kseniya! It has been soooo long since I have updated my site; so much of my life has changed, and yet every day is still a fascination waiting to be uncovered. Things certainly have a way of coming around, and lately I have decided to put down my sewing needles, my books, my perfumes…and decided to pick up my camera. First it started as a hobby, I wanted to take photos of the dresses that I have sewn…just to share some ideas and thoughts along the way. Then a few snaps later it spiraled into an obsession involving models, lenses, shooting locations, time of day etc. and pretty soon I wasn’t take photos of any of my garments…but rather shooting random strangers for trade =P. I picked up a camera for the first time in March (two month ago)…thus time has not escaped me, for I can still recall a few things about my first shoot. Let’s begin! I’ll always remember my first time behind the lens: scared and nerve-wracking; yet strangely serene. Once I started pressing the trigger however, it was smooth sailing. Besides, what is the worst that can happen? You’ll hate your photos and apologize to your model—but in the end it is a learning experience overall…and nobody ever starts in perfection. Having accept this fate is one step towards progression, I am a firm believer in moving forwards, not backwards (at least on a professional standpoint). 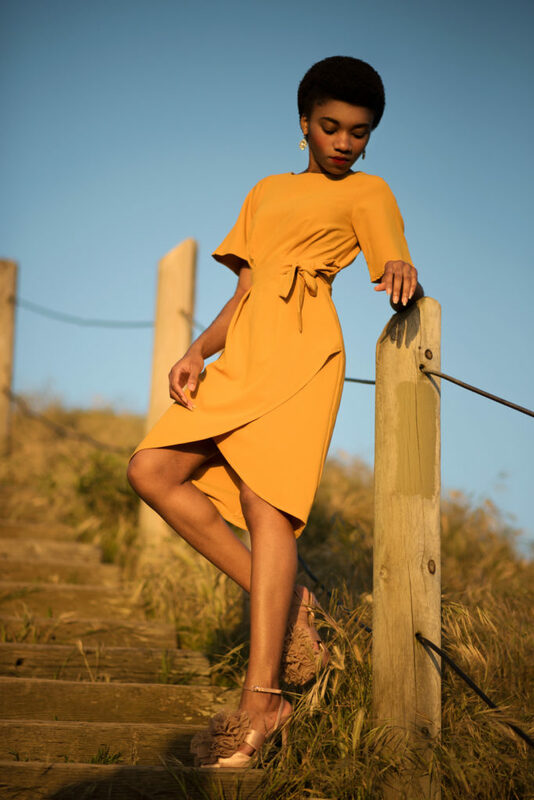 So my story begins when I was contacted by a pretty entrepreneur who called herself “M”, she needed photos for her clothing website and wanted to trade me her time for my prints. I was just grateful for the opportunity to shoot anything but random shrubs on the sidewalk! I usually spend an hour the day before scouting out potential locations. This gives me a good idea as to what colors look best with what outfit (the model will usually send you photos of what she will be wearing the day of the shoot). 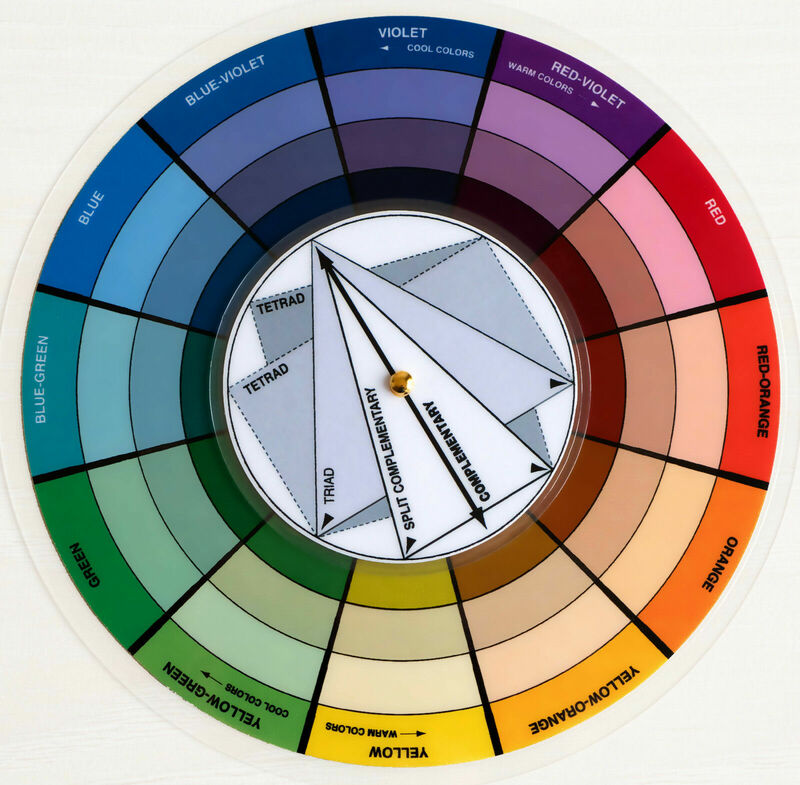 I base my choices on the color wheel, what colors are complementary? What feeling am I trying to convey? Will the photos be color corrected? So many decisions– of course, I didn’t know this at the time…I was just searching for answers. The pocket color wheel that I use. My shoot with M came on a really warm beautiful day in San Francisco, one of my favorite cities. She showed up exactly on time, looking as beautiful and radiant as any model would. I loved her choices in clothing, she was clearly a stylist! We began at the Palace of Fine Arts at around 4 pm. Let me just say that it was a HUGE mistake taking photos in such harsh lighting, every book and manual will tell you this but sometimes you just want to ignore all rules and learn it yourself. Yes, got it, harsh shadows are bad and totally time consuming to remove in Photoshop. We took photos throughout the day, going from the Palace of Fine Arts to Walgreens (a small detour for hair pins and bottled water) to our final destination: Sutro Baths. 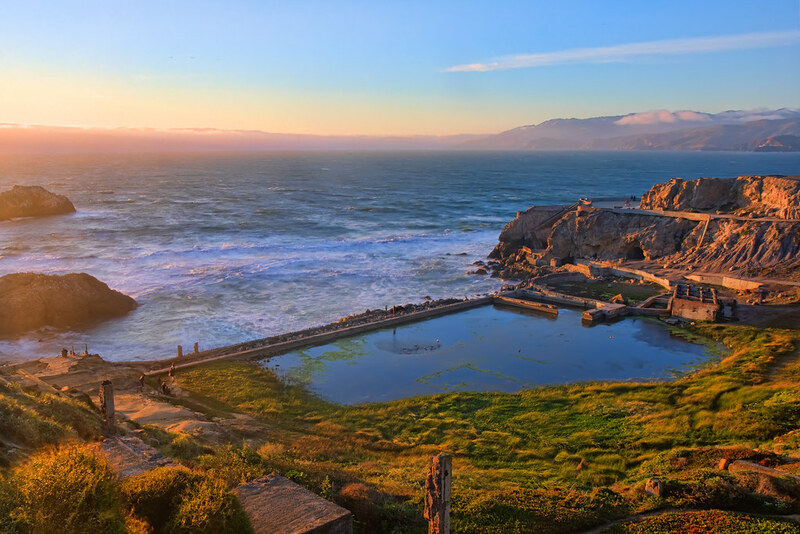 Sutro Baths during the golden hours. Goodness this place is beautiful during the sunset! We had so much fun taking romantic photos in the “golden hour”…and saw many wedding portraits being taken here as well! A photo I took of M during the sunset hour. I love how this dress contrasted with the blue sky. On our way back up it was already getting near 8 pm and we decided to do a last minute session in the parking lot. The light was getting low but who knew the photos would turn out so good! I had to thank M for this one, it was entirely her idea to shoot in the area where the tulips were growing. The white flowers really contrasted well with her palazzo pants. These ones instantly became my favorite photos. Overall my first experience was a good one; I had so much fun, and even had a bigger blast editing them on photoshop! Oh the quirks of spending hours and hours perfecting that good lighting, it never gets old =D. Sitting pretty at 8 pm. I gotta say, none of this would have been half as enjoyable if it weren’t for all the people who made it possible. The DH was there the entire time supporting me and making sure that both I and M were as comfortable as possible…a huge thanks to them for being so awesome and patient!